The little TreeView example supplied with Lazarus is based on a tutorial, which we found useful when writing the demonstration shown in action below. The following page shows the representation of the same data in a level graph. 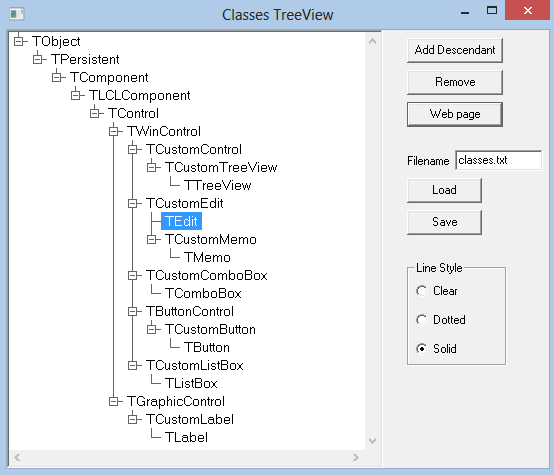 Since a TreeView is designed for displaying hierarchical data, we thought it fitting to display it together with some of the related classes in the Lazarus Component Library (LCL). All the classes shown have links to their documentation. (We have excluded interfaces from the hierarchy). These bullet points might save you some time when getting started with TreeViews. You can construct your initial tree (1) in Pascal code, (2) by using the specialised property editor for the Items property in the Object Inspector or (3) by typing into a text file to be loaded by the program. The possible styles of line for the TreeView's TreeLinePenStyle are psSolid, psDash, psDot, psDashDot, psDashDotDot, psinsideFrame, psPattern and psClear. The display of some of the styles may not meet your expectations. See the Novel unit of Jerzy Griffith's (Delphi XE4) word processor for impressive use of a TreeView to handle the hierarchical components of a novel. The original demo showing addition and deletion of nodes was written by Andre .v.d. Merwe and marked public domain. // Does a root node already exist? // There is a root, so user must first select a node. // Get a name for the new node. //  Add the node as a child of the selected node. // Make sure somthing is selected before trying to delete it.